Hello dear rose friends as we close the door on the first glorious month of spring weather – our potted roses are starting flowering and we are gasping at their beauty; six months now of beautiful roses to look forward to … stunning pics of our garden will follow in this Rose Rambler but please do come and visit when you’re travelling up the Hume Freeway – we’re at theCLONBINANE INTERCHANGEand worth stopping for a wander through our gardens/nursery! Q. Why do kangaroo mums hate rainy weather? A. Because then their joeys have to play ‘inside’! 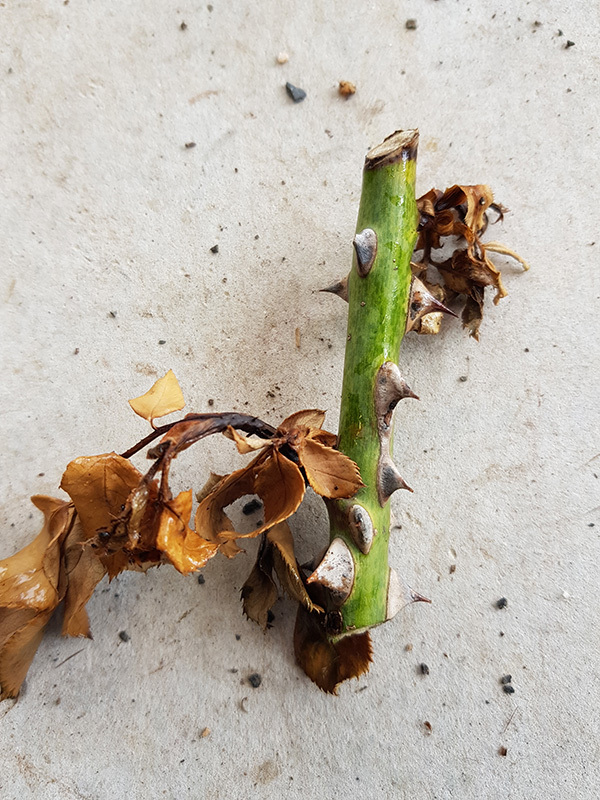 It would now be appropriate to remove all frost damaged foliage so that the roses can set about producing lush, healthy foliage for this season – yes, they might be a bit late flowering but if you nurture them with regular weekly/fortnightly seaweed solution, a good dose of quality organic fertilizer and deep soaking water if it gets hot and you don’t get rain in your area, you’ll be rewarded with lovely blooms soon. Most plants will, however, recover and live to endure possibly greater issues with an expected very hot summer??? Whatever the weather, our plants seem to endure – next week I will talk you through effective, economical and essential water management in your garden during this flowering season. 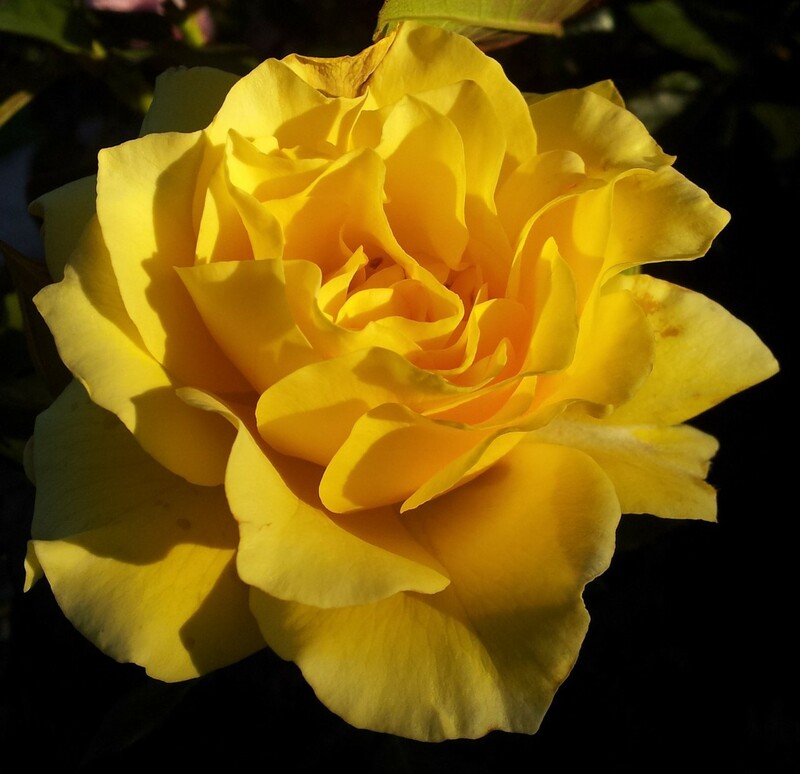 11th and 12th November – do come along to this most magnificent event in the State Rose Garden at Werribee. 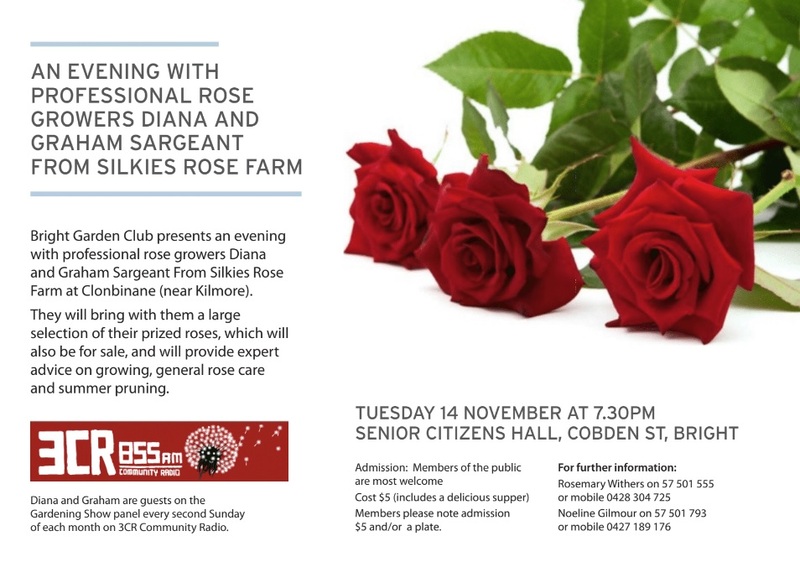 Diana will be doing a stage presentation with Jane Edmanson – more details in following Rose Rambler editions. If you have a group of friends or belong to a Club who like to take outings to lovely places, please organise your next visit to us here at Clonbinane … see you all soon! 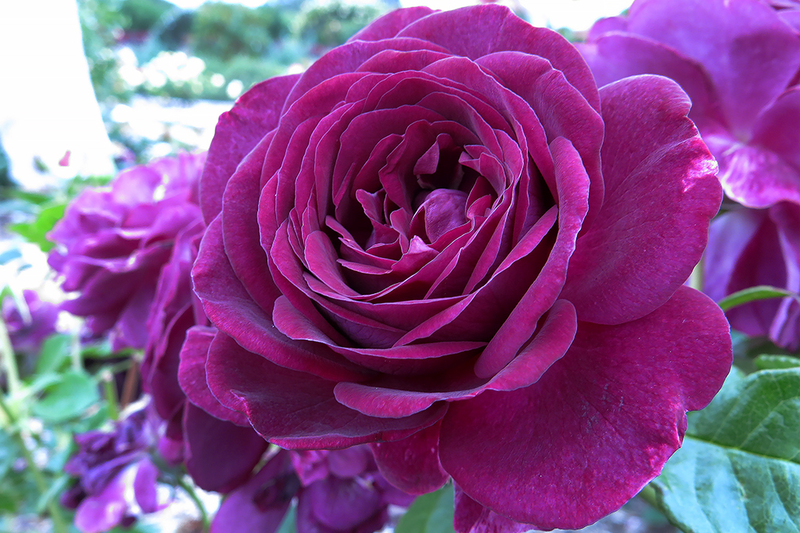 Hello, dear rose friends as the lawn just keeps on growing and needing mowing …I guess it’s the same at your place?! 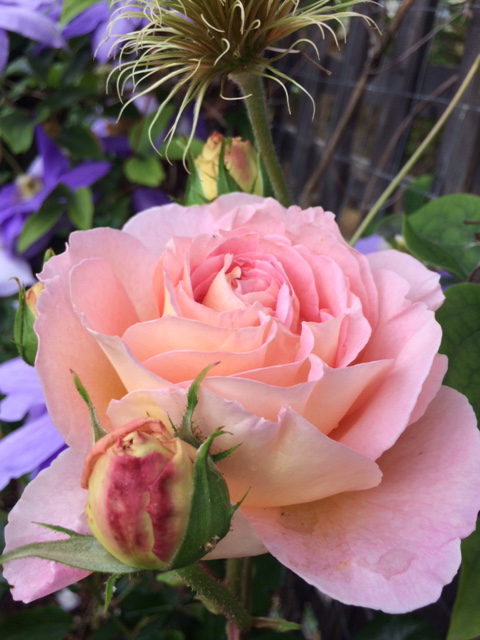 Last week inspired lots of responses as you beautiful gardeners told us which roses were the first flowering in your gardens … how amazing that the same varieties came up ‘FIRST’ in so many gardens! 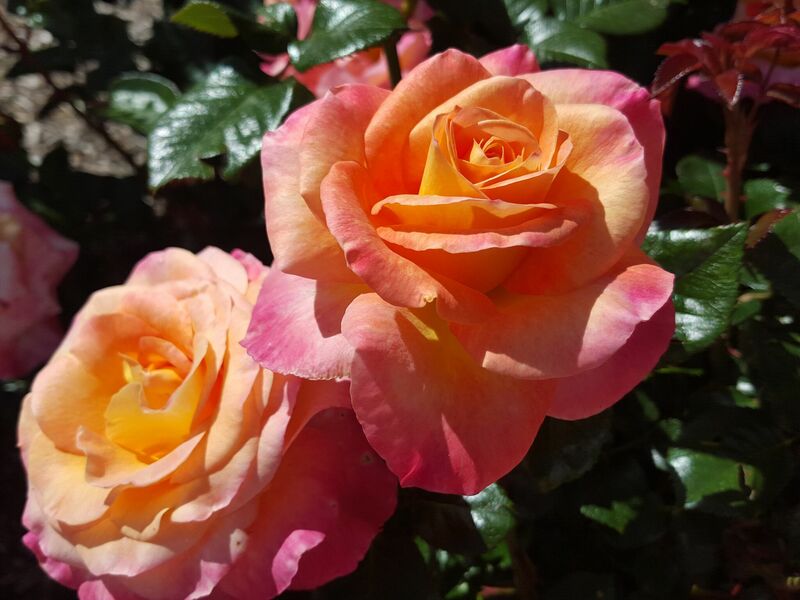 After enjoying so many magnificent roses flowering all over northern Victoria from Kerang, along with the Murray River through to Echuca we’ve arrived home to a nursery bursting forth with lots and lots of colourful rose like this fragrant VICTORIA GOLD…. Thanks to Ben and Tova for holding the fort while we were away for a few days! 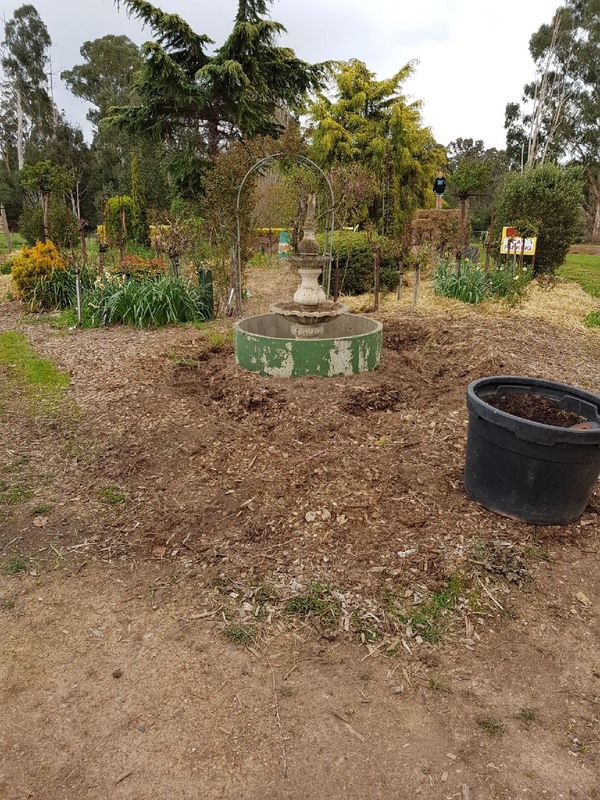 LIQUID FERTILIZER … I’ve had some enquiries about how to go about making your own liquid ‘weed-tea’ fertilizer from a range of non-seeding weeds along with a combination of various manures which you can acquire either in your own garden or from a local source. 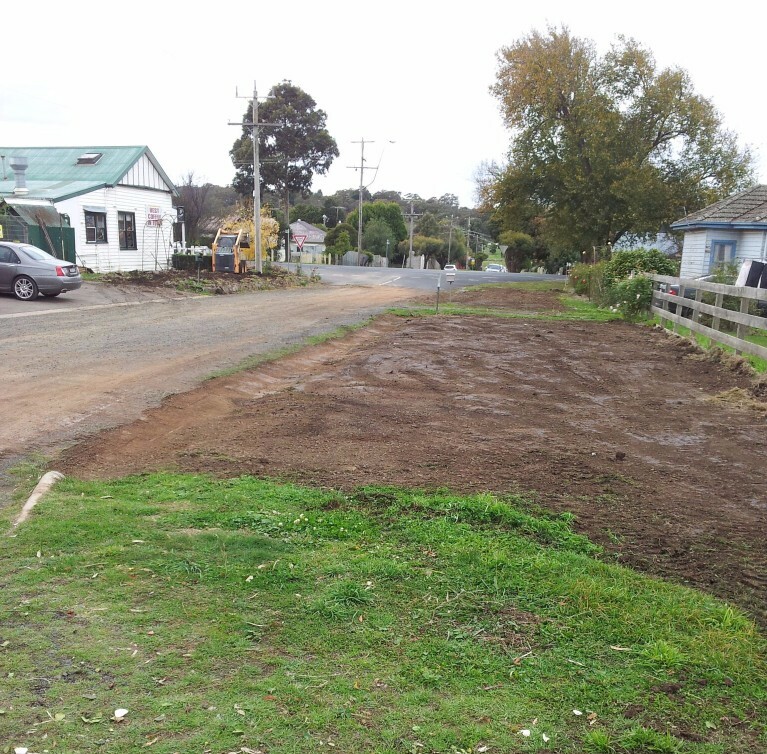 Get a hessian bag – you might find one at your local feed store; perhaps a potato grower. If you cannot find a hessian bag you could use an old pillowcase or maybe a sheet that you can lay weeds/manure in and securely tie to suspend in water.The container you use might be a wheelie-bin, an old garbage tin or a 44-gallon drum – whatever you can find that has a lid – yes, the brew will stink – locate it in the furthest corner of the yard! Every couple of days, lift the lid and check the brew; plunge the suspended ‘sack’ of weeds and manure up and down to be sure nutrients from the contents are releasing into the water – add more water perhaps and seaweed powder or solution will be beneficial too! Q. Why didn’t the toilet paper cross the road? A. Because it was stuck in the crack! After around six weeks of brewing take 1-2 litres of fermented liquid, dilute it in a 9 litre watering can of water and pour over the soil in your rose garden! This is excellent liquid fertilizer – especially if you added seaweed powder along with some kind of animal manure to the initial weed sack. Use liberally every couple of weeks. Because you’re never sure of the fertilizer analysis of this kind of feeding, I recommend you use a Complete Organic Fertilizer at least twice annually to be sure your plants are being fed a complete range of nutrients which ensures continually healthy foliage and masses of flowers throughout the flowering season. 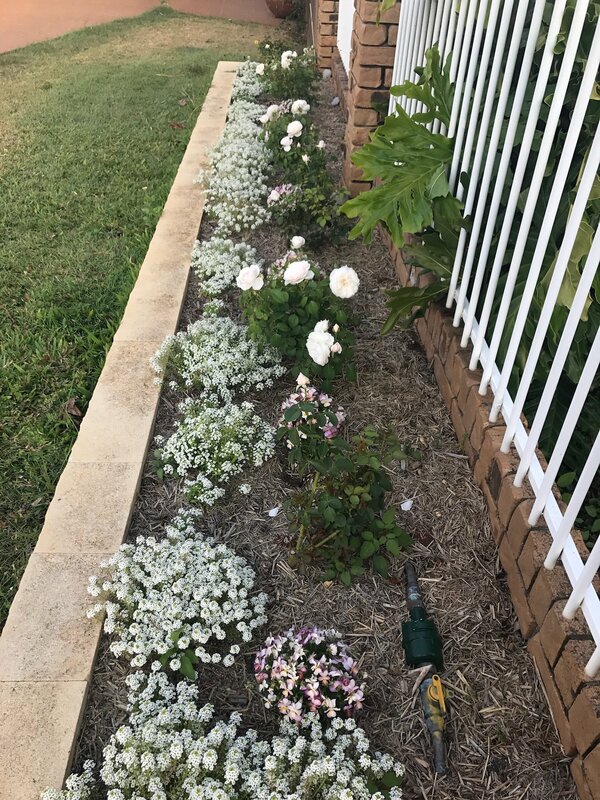 My response to Rhona: Ok … you know what the major consideration is: DO YOU HAVE TIME AND WATER TO WATER POTTED ROSES EVERY DAY??? Pots are a pain in the backside because of the commitment to watering and fertilizing! 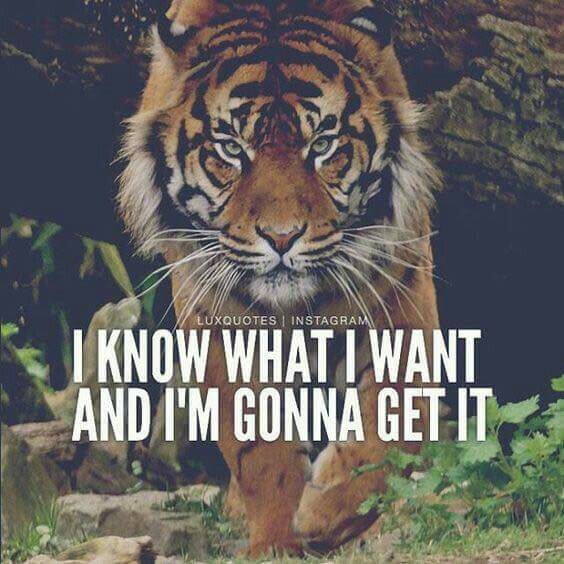 I think you know what I would recommend but you do what works for you! Cheers … Diana & Graham both agree! So you can see, despite another minus 2 frost earlier this week, roses in 20cm pots which act like a humid-crib for their roots, on higher ground up in the Rose Nursery are ready to flower … amazing to all of us! 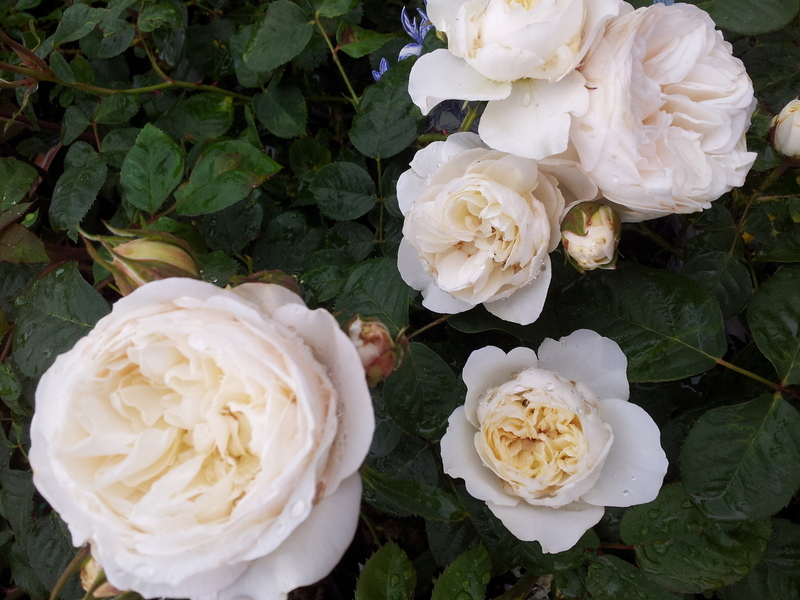 How exciting and how beautiful and how very lucky we are that we all love roses – I think we’re in for a stunning flowering season, the rosebuds are so pumped full of deep soaking rain … it’s raining as I write! Sorry to our far north friends who are experiencing drought but have had some respite last week perhaps???!!! ¼ cup Eco-oil and ALWAYS ADD A SEAWEED PRODUCT – we use and recommend ECO-SEAWEED POWDER – extremely economical as you use your own water! Q. How many apples grow on trees? A. All of them! Q. How many peanuts grow on trees? A. Peanuts grow in the ground! You’ll trick the kids with these two! Enjoy the giggles!!! This GOLDEN DIOSMA hedge was very visible in aerial photos we had taken of our property back in 2003 and after severe frost events this past winter, it died. 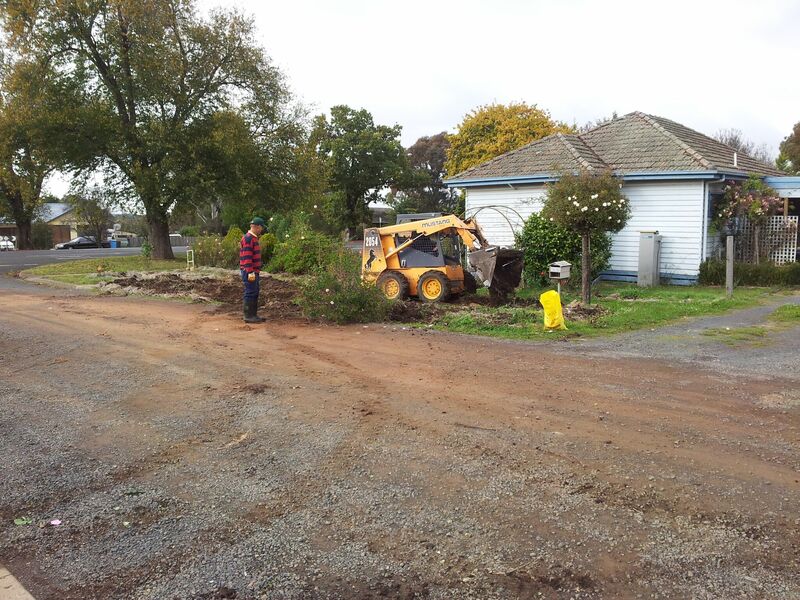 I called 3CR Garden Show on Sunday morning and the expert panel suggested that the hedge had done its time and demised due to age – I took their advice and removed it – but oh, gosh, what a hole it leaves in a very prominent part of our entrance driveway. 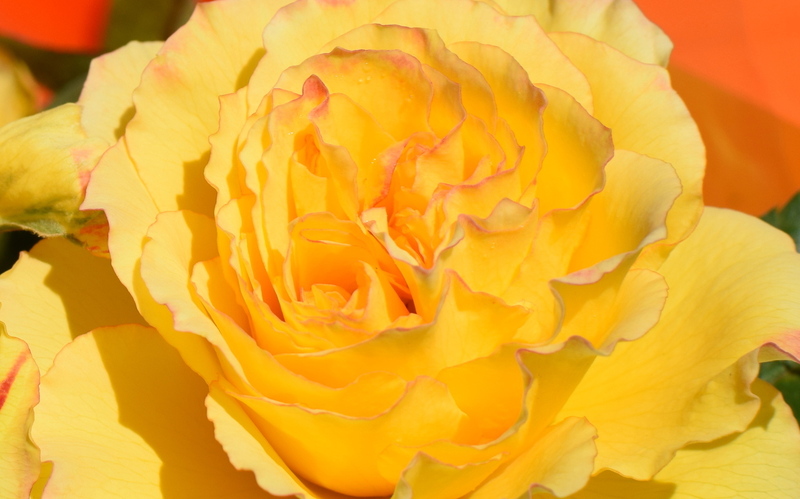 Solution … I will plant a hedge of THE GOLDEN CHILD roses so that when my Mother visits (regularly) I can remind her that I didn’t plant the hedge for my BROTHER but … yes, for her other GOLDEN CHILD, Diana! 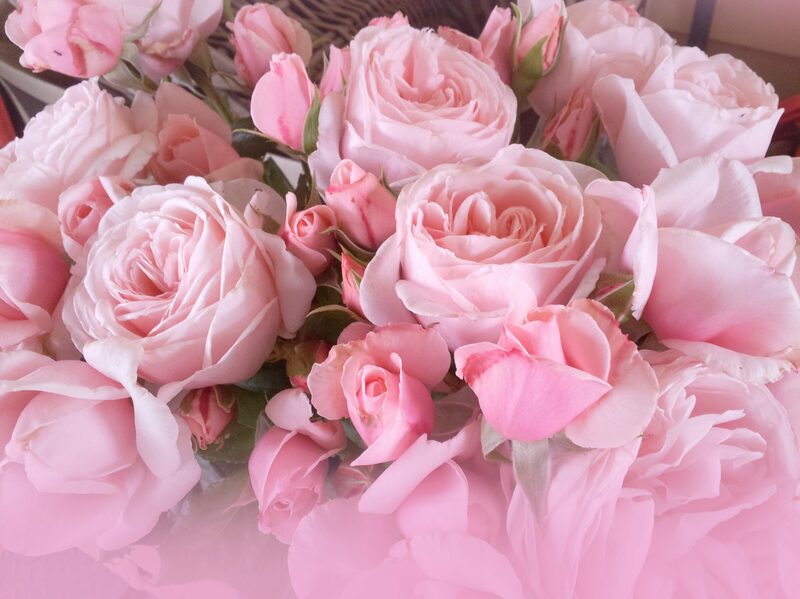 What fun you can have with the names of roses … cherish all the wonderfulness of your garden in this magnificent spring! 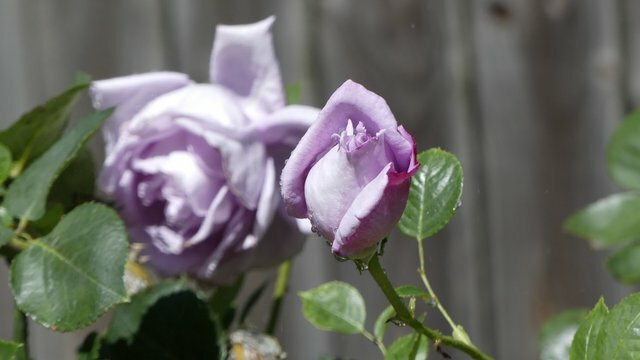 Hello, dear rose friends. When the Rose Rambler was posted 10 years ago today, it went with a sticker celebrating the arrival of our grandson Logan who now regularly visits the Rose Farm and told us recently that he would like to come and work here on weekends! Happy 10th Birthday Logan from Oma and Poppy! Congratulations to the great team who won the Grand Final last weekend … what a game! I put this poster in because it actually reminds me of the drive and determination it has taken us to pursue and in most cases, achieve our dreams in the horticultural industry – we’ve had some tough times in the past 30 years!However, all considered, it’s been a sensational journey and we still love doing what we do; grow beautiful roses for gardeners to enjoy in their gardens around Australia! We are so, so lucky to be living our dream! Q. If teeth were shoes what would they be? A. GUMBOOTS … how could you NOT get that? 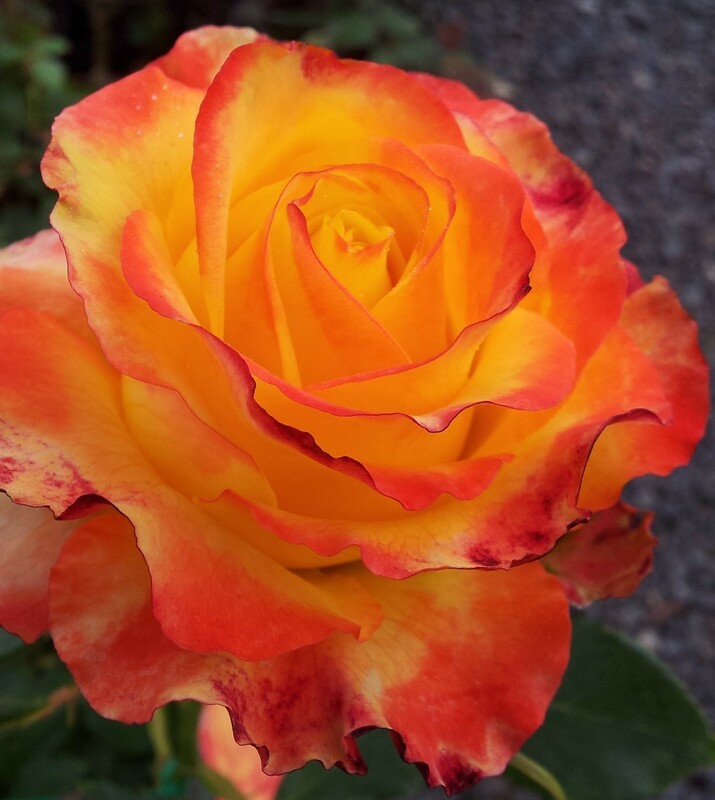 yes, you’ll be fertilizing the soil which, in turn, will feed your roses. Be sure and purchase the best quality fertilizer you can buy locally!!! MY RESPONSE … Hi Penny … Quite frankly, I wouldn’t use it at all – seriously, unless you add ALL THE OTHER NUTRIENTS, (POTASH, TRACE ELEMENTS, ETC. ETC. ETC.) using JUST blood and bone would be like feeding your roses McDonald’s – they’ll get a rush but not a lot of substance! 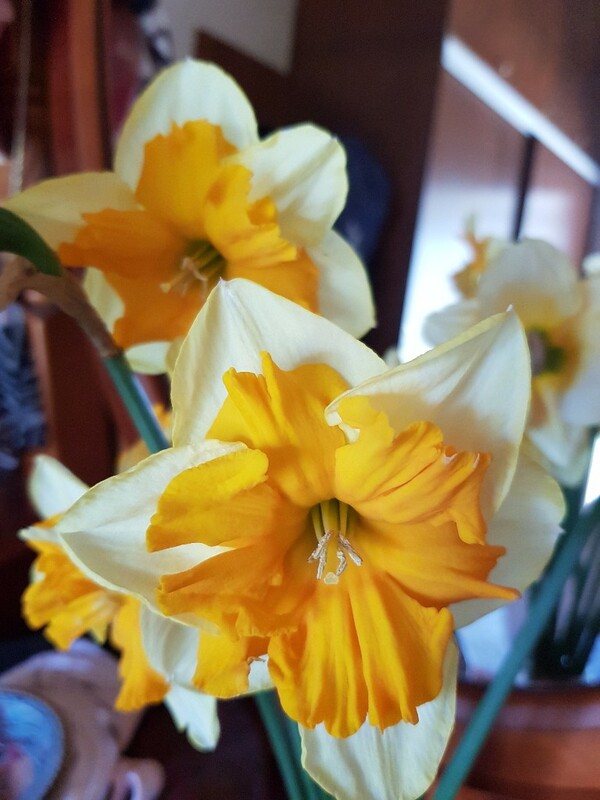 Fertilizer manufacturers have taken the science of feeding plants and put it in a bag for us – here at the Rose Farm, we have magnificent fertilizer – COMPLETE ORGANIC FERTILIZER manufactured at Invergordon about 1 hour up the road. Yes, we’re lucky to have this available to us very close to home; it suits our sustainable policy! Q. What do you get when you cross a chicken with a cement mixer? A. A bricklayer. 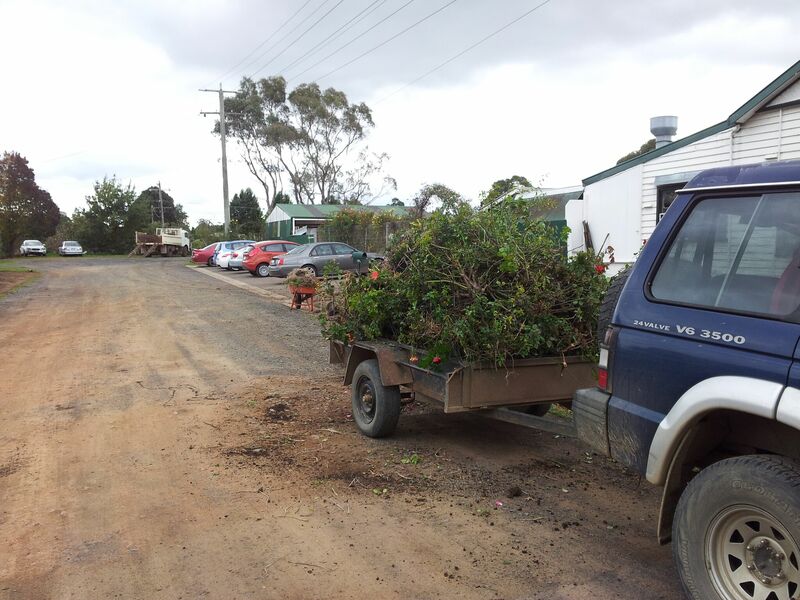 Clever fertilizer application – just prior to soaking rain! If using a liquid fertilizer, ALWAYS add ECO-SEAWEED POWDER as a bonus! 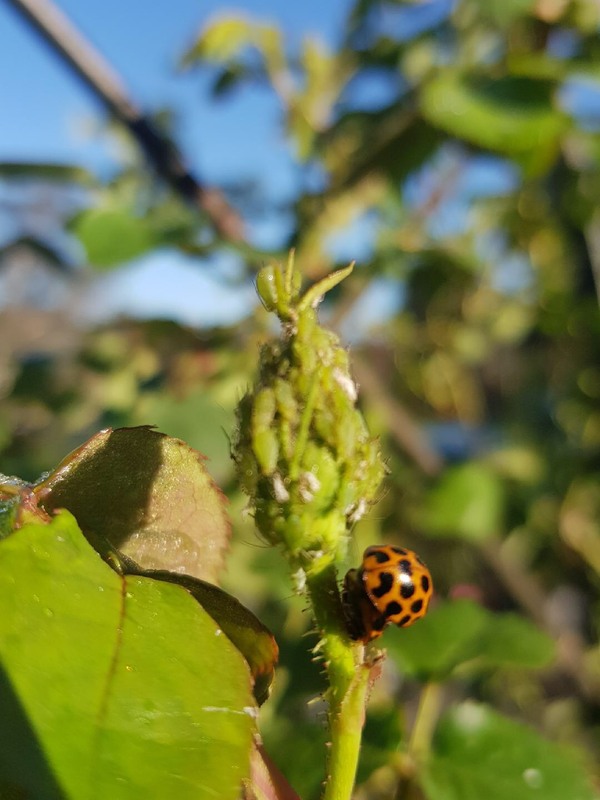 If you regularly apply animal manure/compost around your roses, you should be able to alternate, using commercial fertilizer every 6 months or so just to be sure you have a good balance of minor nutrients and trace elements which are REALLY important to maintain healthy foliage, prolific flowering and generally happy roses! 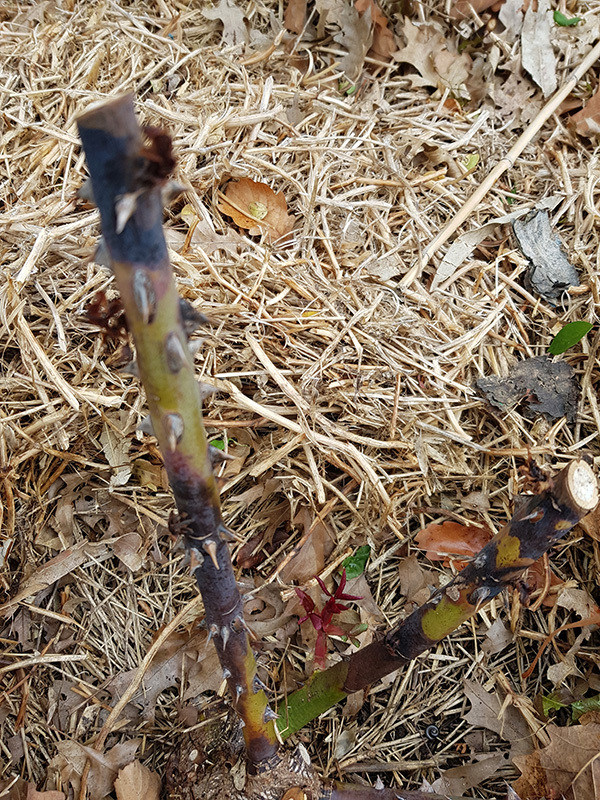 Roses will let you know they need fertilizing when the foliage is continually plagued by black spot which is definitely a sign of stress! 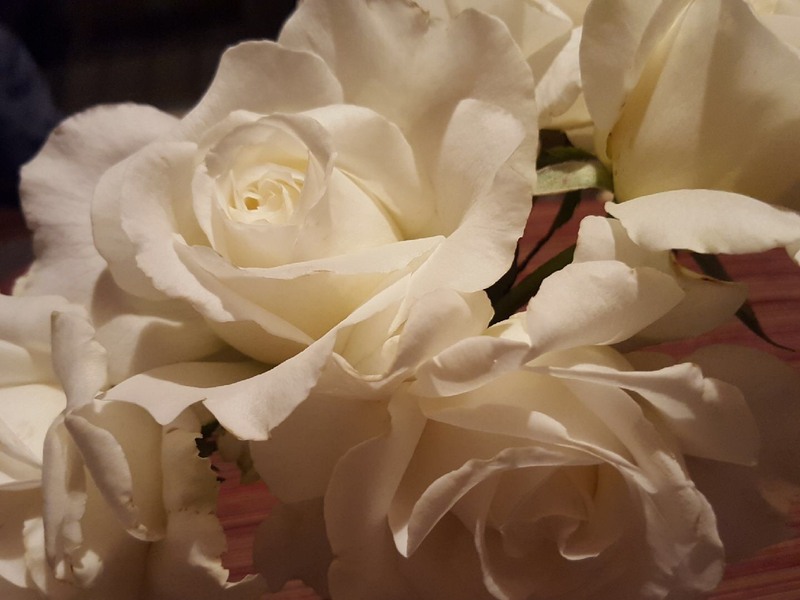 GUARDIAN ANGEL is a very special rose – ideal to gift for the family who lost their child during pregnancy or birthing or simply to have a wonderful creamy-white mass of blooms on an extraordinarily healthy shrub rose! The flowers are enduring through all weather and vase well too! Ideal gift for the loss of a pregnancy or baby! 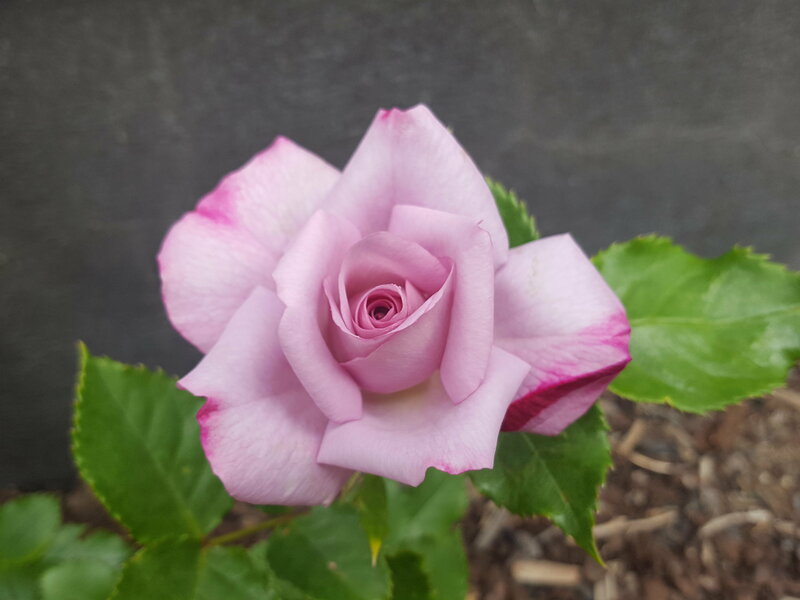 EARTH ANGEL is a magnificent addition to the KORDES PARFUMA COLLECTION with extremely healthy, dark green foliage on a rather short bush to 75-90cms tall and nicely rounded. 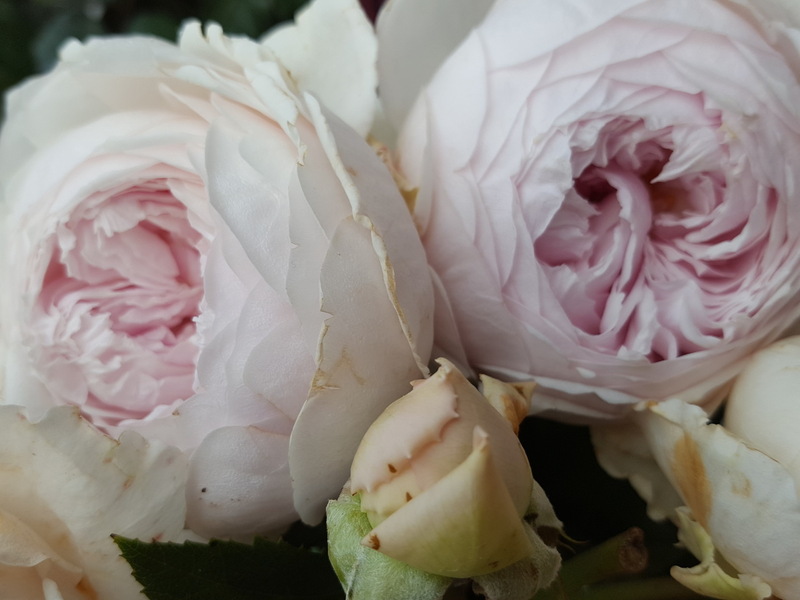 The beautifully shaped old-world style blooms remind me of a peony with a thick, swirling mass of petals as the bloom slowly opens to present a fresh fruity fragrance which is particularly evident on a warm, still evening. Hold a nearly open bloom in your palms – the warmth from your body will entice the sweet fragrance to emerge. 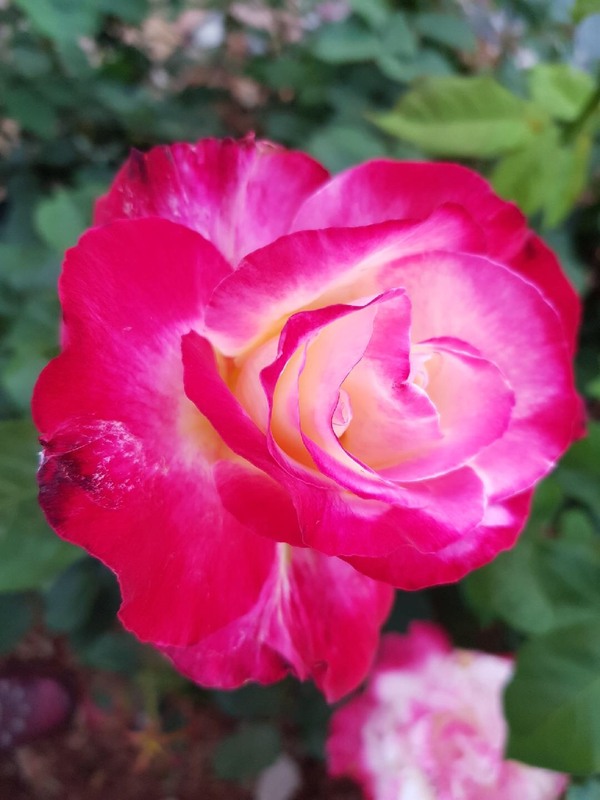 If you’re out and about in country Victoria during the coming weeks there is a Rose Show at the Kyabram Town Hall – no competition but every gardener in town will put their lovely roses on display – Graham will be there with potted roses and products. He’d love to have a chat with you there!!! On 15th October there will be six magnificent gardens open in CHARLTON where the Annual Rotary Art Show is exhibiting. 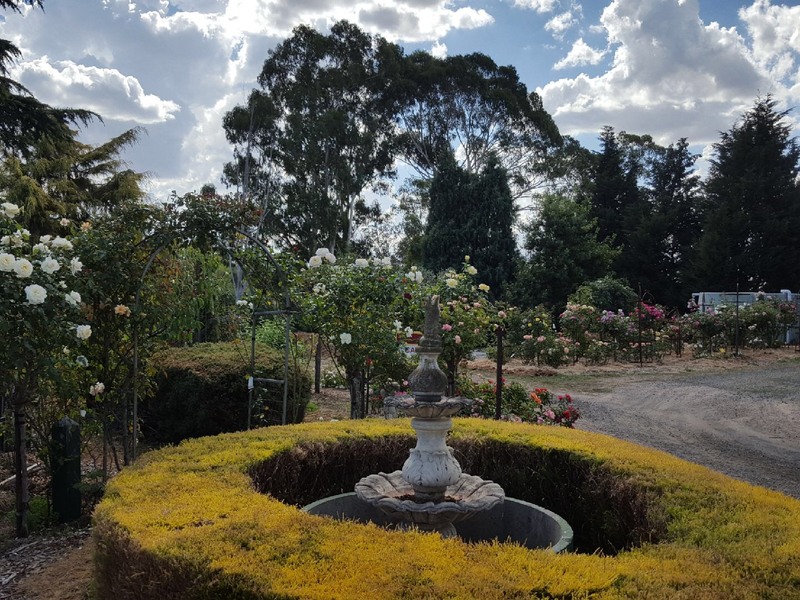 Gra and I will be wandering around there too as we make our way to KERANG for the NORTHERN ANNUAL GARDEN CLUBS CONFERENCE ON MONDAY 16th October – we are keynote speakers at this event.